Rice Kheer or Chawal ki Kheer is a traditional Indian rice pudding which is quite easy to put together and makes for a great dessert. The only challenging part of this recipe is the ingredients proportion. If you master that, this recipe is s breeze to make. Here is a video and step by step pictures of how to make Rice Kheer Recipe. Kheer is an all time favorite Indian dessert. All of us, in fact have grown up, enjoying it with the family and for festivities. I always look for an excuse to make this delicious rice pudding and usually make it while I am cooking something else. By the time I am done with my cooking, my kheer is also ready. Rice Kheer or Chawal ki Kheer is a milk based sweet and this rich, creamy dish is the perfect way to finish the meal. The ingredients are usually available in the kitchen, and the sprinkling of dry fruits on it, take this dish to another level. 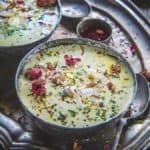 If you want to make a different variation of this dish, then try out the Paneer Ki Kheer, Lauki Ki Kheer or Shakarkhandi Kheer. They are just as easy to make and as flavorful. Rice Kheer also brings back many memories of my childhood. Hence, whenever I eat Chawal ki Kheer, I feel all happy and at peace. 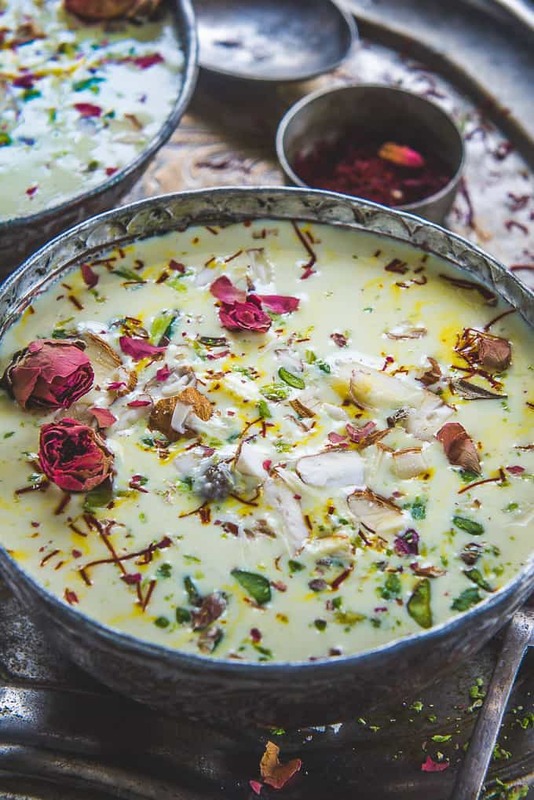 Craft this Kheer whenever you feel like walking down the memory lane and whenever you feel too tired because of a demanding day. Here’s a super easy recipe for making Rice Kheer. Which rice to use for Kheer Recipe? You might think that basmati is good choice to make kheer but actually it is a preferred rice to make Biryani, Pulao etc but not Kheer. To make Kheer, always choose small grain rice which gets slightly mushy while cooking. It will give the kheer a nice creamy texture with the starch of the rice mixing with the milk while cooking. I like to use Jeera Samba Rice, Gobindobhog, Ambemohar etc to make kheer. You can use any rice which fits the description. If at all using basmati rice to make Kheer, then use the broken variety of basmati rice and not the long grain. How to make Chawal ki Kheer Recipe with Cooked Rice? To make rice with cooked rice, add 1 cup of cooked rice per litre of milk and cook until kheer thickens. Then add sugar and other ingredients as per the below recipe. To make kheer in pressure cooker, boil the milk in a cooker. Once it comes to a boil, add rice and cardamom powder. Close the lid and pressure for one whistle on high heat. Then simmer the heat and cook the kheer for 20-25 minutes on low heat. Remove the cooker from heat and let the pressure release. Now add sugar and mix well. To make rice kheer using condensed milk, cook the milk and rice until kheer is thickened and rice is nicely cooked. Now add 1/2 cup of condensed milk and do not forget to reduce the amount of sugar. How to make sugar free Kheer? Cook the kheer as mentioned in the recipe below until the step to add sugar. Add stevia or any other sugar free substitute and mix well. How to make Kheer using Jaggery? Cook the kheer until the rice is cooked. Now remove the pan from heat and let the kheer down slightly. Add liquid jaggery or grated jaggery and keep it for 10-12 minutes until the jaggery slightly dissolves in the kheer. Now put the pan back on heat and cook the kheer on very low heat until the jaggery melts completely. Use a short grain sticky rice to make kheer. Use full fat milk to make the kheer. You can skip adding saffron if you wish to. Soaking the rice is very important so do not miss this step. Cook the kheer on low heat and in a heavy bottom pan. Keep stirring after regular intervals. Make sure the malai doesn’t get stuck at the corners of the pan. It should combine with the rice and milk and regular stirring will make sure of that. You can fry the dry fruits in little ghee before adding them in the kheer. It will give a different flavour. When it comes to a boil, add rice, saffron, raisins, cardamom powder and grated coconut. Cook on low heat till kheer thickens. Keep stirring continuously. Add sugar and cook for a minute. Rice kheer or Chawal ki kheer is a traditional Indian rice pudding which is quite easy to put together and makes for a great dessert. 3 tbsp Rice Washed and soaked for 30 minutes. When it comes to a boil, add rice, saffron, raisins, cardamom powder and grated coconut. Cook on low heat till kheer thickens. It will take 45 minutes to an hour for the kheer to thicken. Garnish with slivers of almonds and pistachios. 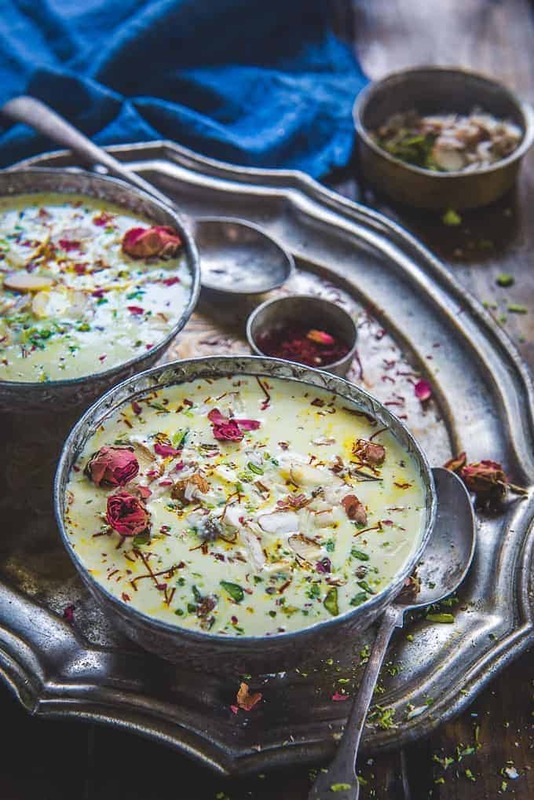 My all time fav chawal ki kheer looks super yummy and creamy dear 🙂 clicks are tempting me ! !